HOW GOOD IS THE KIA SOUL EV? Kia, whose range is available from Howards Motor Group in our Weston-super-Mare showroom, has recently gone electric. The Kia Soul EV marries up the Soul’s seriously quirky looks with a commitment to the environment that’s greener than a composting toilet, but a much better drive. Admirable though this may be, no one’s still yet sure what category to place the Soul into. Hatch? Baby people carrier? SUV? Who cares? In a world of ‘me too’ car brands, it’s deliciously different. And especially so now that it has some major electric tech stashed into its distinctively upright frame. 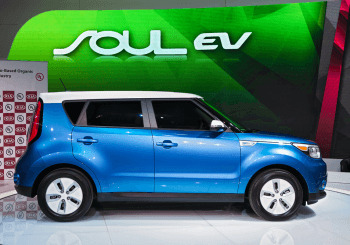 The Soul EV looks pretty much like the standard Soul. Of course, there’s no radiator grille (there’s no radiator), the wheels are nicely retro and there are subtle EV badges dotted here and there. All the really big changes are under the bonnet. There’s none of that petrol or diesel engine nonsense going on. Instead, we have an 81kW electric unit to power the front wheels. That equates to around 110bhp. Coupled with around 211lb ft of torque, the Soul EV offers better performance than you’d normally associate with an electric car. Really? How fast are we talking about? Don’t get too excited. Although the 0-60mph figure is a decent 10.8sec, the top speed of 90mph won’t trouble too many M3s on the autobahn. The technology is pretty smart. The EV comes with state-of-the-art lithium-ion polymer batteries. With an energy density of 200Wh/kg, they’re class leaders and will give you a range of 132 miles. The Kia Soul EV will cost £29,995, but you’ll be entitled to a £5000 government subsidy. That’s not cheap, but if you’re traditionally an early adopter of techy stuff or you work for the environmental-health department, your green credentials will be absolutely impeccable. What about the inside? All is calm. In fact, the hessian seats are quite far out, man. Even further out are the loudspeakers that glow in the dark to the beat of the music. How does it work? Simply press ‘Go’ and choose ‘Drive’, like any other automatic car. The drive is surprisingly smooth for an electric car, without shudder, thanks to a nicely calibrated driveline. If it has a fault, it’s the boot size at just 281 litres. But then, with a limited range, you’ll probably not be packing for your annual holiday down to the South of France. That’s not really what it’s for. Truth is, the back of the car is full of battery packs. Hey, you can’t have everything. But it’s comfy and no transmission tunnel means access is dead easy. What about refuelling? Well, you plug it in just like your smartphone. The Kia Soul EV will recharge in 13 hours on a normal household plug. Put it on at bedtime and it’s good to go in the morning. If that’s too long for you, sources at Kia have suggested that a fast-charge station will do the job in little more than half an hour. To find out more about the Kia Soul range, get down to the Howards Motor Group showroom in Weston-super-Mare soon, or contact us for more information.